Opening Reading: II Corinthians 4: 1-12. Last month, I spent a weekend leading a retreat with readers, looking at the life story and the relevance of the writings of Saint Patrick. 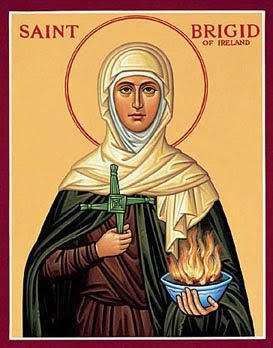 A few days later, a month ago this day [17 March 2016] it was the feastday of Saint Patrick, who, along with Saint Brigid [1 February] and Saint Columba [9 June] is one of the three patrons of Ireland, marked in the Book of Common Prayer [p. 22] with what we might call red-letter days. Be thou my vision (Church Hymnal, No 643). Some years ago, I spent an afternoon in Glendalough, Co Wicklow, looking for what I thought would be the remains of a great Celtic monastery. Sometimes, our images of Celtic Spirituality are intricately linked with the nation-state-building myths created by an Irish nationalism that was often narrow in its vision. Yet, Be thou my vision, Hymn 643 in the Church Hymnal, was versified by a member of the Church of Ireland, Dr Eleanor Henrietta Hull, using another translation of an earlier poem or prayer. 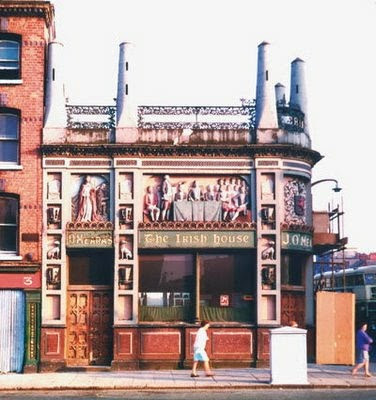 The popular images of Saint Patrick at that time in stained-glass windows, road-side statues and popular postcards show him standing on a bed of shamrocks decked in the robes and mitre of a truly Tridentine bishop. Of course, I would point out that green is the wrong liturgical colour both for Lent and for a saint’s day. But why was he never seen in those popular portrayals in convocation robes or in a simple alb and stole? Because the message was clear: Celtic Christianity was for Roman Catholics only, and at that for a particular type of Catholicism. Firstly, many of the cathedrals and churches of the Church of Ireland stand on ancient Celtic monastic sites. 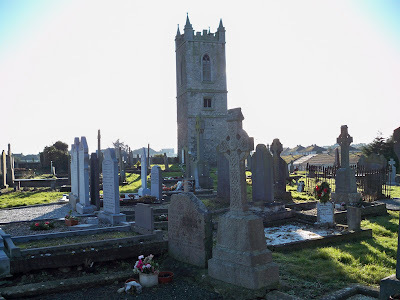 If you have ever wondered why so many Church of Ireland cathedrals – Achonry, Ardagh, Clogher, Clonfert, Elphin, Emly, Ferns, Kilfenora, Killaloe, Kilmacduagh, Kilmore, Leighlin, Raphoe, Rosscarbery – are in small villages or remote locations, or why it took so long to build cathedrals in Belfast, Enniskillen, or Sligo, or why still we have no cathedral in Galway, then you begin to realise the lasting influences of the Celtic monasteries. 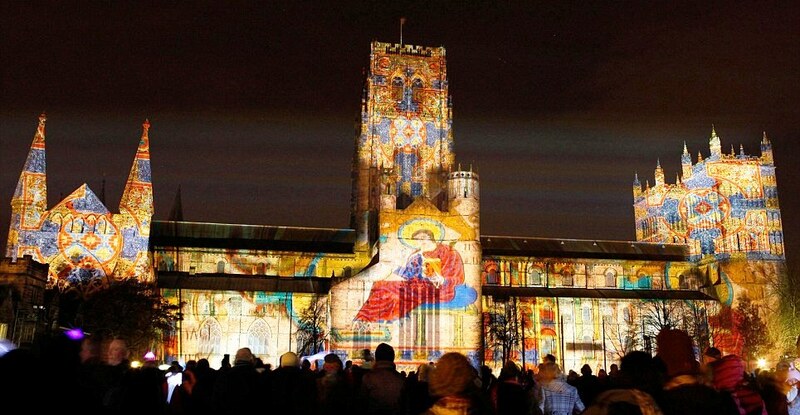 You may be ordained in one of these cathedrals, or become a curate or rector in a church with the tongue-twisting name of an otherwise-forgotten Celtic saint. So we should know its place and part in the story of our church. And thirdly, modern spirituality, in a dynamic way, has drawn on and has been enriched by many resources associated with Celtic spirituality, enriching the life of the Church of Ireland at every level. At an academic level, this interest has been stimulated by scholars such as James Mackey, Ian Bradley in the Church of Scotland, the Jesuit Diarmuid Ó Laoghaire (1915-2001), the Carmelite Peter O’Dwyer and the Redemptorist John Ó Ríordáin, and writers such as the late John O’Donohue, poet and author of Anam Cara (1997) who died eight years ago (4 January 2008). The Gaelic Athletic Association was formed in 1884, the Gaelic League by Douglas Hyde, a rector’s son, in 1893. Our most popular English-language version of Saint Patrick’s Breastplate, Frances Alexander’s I bind unto myself today (Irish Church Hymnal, 322) was first sung and published as late as 1889. The English-language version of Be thou my vision by Mary Byrne and Eleanor Hull (Irish Church Hymnal, No 643), which refers to God as “my high tower,” was only translated and versified in 1905, and was first published in a hymnal in 1915. Since the 1980s, Celtic-style books of prayers by Canon David Adam, former Vicar of Lindisfarne, have become widely popular, as has a wave of books about Celtic Christianity, study courses, and Celtic interest networks. Her father Dubtach was a pagan nobleman in Leinster, and her mother his Christian bondwoman, Brotseach, whom he sold to a Druid who lived at Faughart near Dundalk. There the child was born in the mid-5th century (ca 451 or 453) and baptised Brid or Brigid. It is said that as a child she was taken to hear Saint Patrick preaching, and as she listened to him she fell into an ecstasy. Cuthbert returned to Lindisfarne as Prior but then travelled throughout Northumbria. In search of a solitary life, he built a round cell and chapel south of Lindisfarne, and he lived there for eight years, devoting his time to prayer. In York on Easter Day, 26 March 685, he was consecrated Bishop of Lindisfarne, following in Aidan’s footsteps. He died in 687. During the Viking raids in Northumbria in 875, Cuthbert’s followers moved his body and carried it from place to place for safety. In 883, he was buried in Chester-le-Street and in 996 he was reburied in Durham Cathedral, where his shrine remains to this day. Lichfield: Saint Chad, who was educated at an Irish monastery ca 651-664, established the church in Mercia, the pre-Norman Kingdom of the English Midlands, and died in 672. 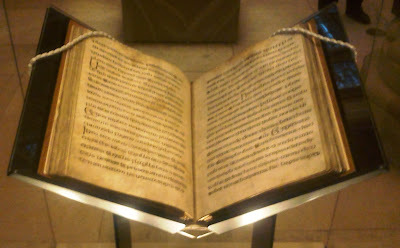 The Book of Chad, now one of the great treasures of Lichfield Cathedral, predates the Book of Kells by about 80 years. Last month, I was in Lichfield Cathedral for the patronal festival of Saint Chad [2 March 2016], who is described on the cathedral website as an Irish-born saint. Certainly, he seems to have been trained in an Irish monastery. 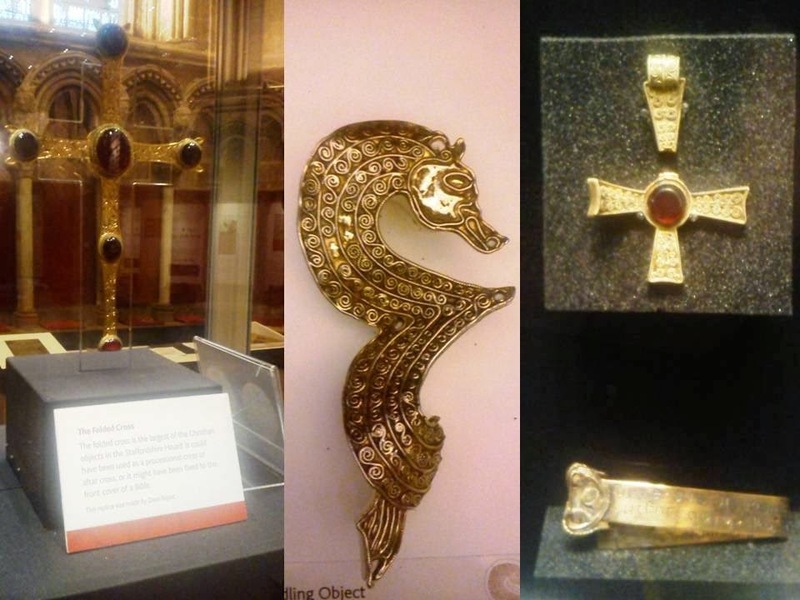 Over the last few years, Lichfield Cathedral has hosted a number of exhibition of recent finds in a large Anglo-Saxon horde in fields near Lichfield. Their discovery points to an interesting interaction between the Saxons of Mercia and the Celtic church in Northumbria and perhaps even Ireland before the arrival of Saint Chad. In the time we have for meditation and contemplation, I suggest you take the Church Hymnal and meditate on the words of Hymn 611 (Christ be beside me) or Hymn 322 (I bind unto myself), both adapted from The Breastplate of Saint Patrick. through Jesus Christ our Lord..
Saint Hilda’s Priory, the Order of the Holy Paraclete, Whitby. Ian Bradley, The Celtic Way (London: Darton, Longman and Todd, 1993) ... Ian Bradley, a Presbyterian minister in the Church of Scotland, has lectured in the Department of Theology in the University of Aberdeen. This is a good, sound introduction to Celtic spirituality. 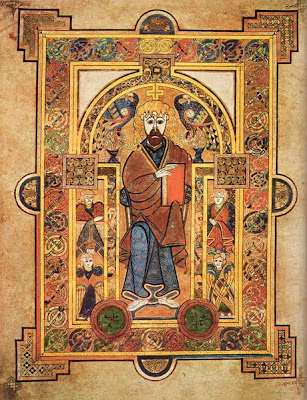 Lemuel J. Hopkins-James, The Celtic Gospels, their story and their text (Oxford: OUP, 1934/2001) … Hopkins-James transcribed the Book of Chad in 1934. Mary Keaney, Celtic Heritage Saints (Dublin: Veritas, 1998) … introduces us to scholars, adventurous sailors, saints who get their heads chopped off, friends and enemies of kings. Good for using in schools, Sunday schools, and with confirmation classes. (Revd Canon Professor) Patrick Comerford is Lecturer in Anglicanism, Liturgy and Church History, the Church of Ireland Theological Institute, and an Adjunct Assistant Professor, Trinity College, Dublin. This lecture on Sunday 17 April 2016 was part of the Spirituality module in Pastoral Formation with part-time MTh students. This is an inspiring lecture. So much to ponder - I was born into the Congregational Church in Boston and attended Protestant churches in different parts of the world. We lived in Ireland for over 40 years and I eventually fixed on the Church of Ireland. Now we are in Seattle and I am active in a Lutheran church.